[ACT](VC): Legion20000 "Seeker, Light Blaze Dragon" (If your opponent's vanguard is grade 3 or greater, this unit may return four cards from your drop zone into your deck once, search your deck for the specified card, and Legion) [ACT](VC):[Counter Blast (2)-card with "Seeker" in its card name] If this unit is Legion, choose up to three of your units, and those units get [Power]+5000 until end of turn. This ability cannot be used for the rest of that turn. [AUTO](VC):[Choose a card from your hand, and discard it] When this unit's attack hits a vanguard, you may pay the cost. If you do, search your deck for up to one card with "Seeker" in its card name, call it to (RC), and shuffle your deck. Where's my corresponding Revenger, Dark Vader Dragon...? I want my Star Wars reference, dammit. Anyway, this is one of the promos we didn't get round to reviewing. But here it is closing the week. He legions with Seeker, Light Blaze Dragon, and for all that, he can use an ACT skill that costs 2 counterblasted Seekers and gives 3 units 5k until the end of the turn. (Note that it states units, so it's possible to pick the legion mate AND Light Saver itself, giving the VG essentially 10k power for the turn). Its normal skill is to lose a card from the hand when his attack hits the vanguard, and then superior call a new Seeker from the deck. ...I can't say I'm a big fan. For 2 CB I could knock a potential 15k more shield out of the opponent, but to be honest for virtually the same cost I could use Thing Saver Dragon who can knock out that much if not more (because 22k unboosted is still 20k for 2 triggers to pass) by launching another attack. And the 2nd Twin Drive could at least help to add more power via triggers which means few scenarios in which Thing Saver would do worse. 2nd skill could have some merit but I don't really believe that trying to do another clan's gimmick except worse is a good idea. Spike Brothers does a better job at multi-attacking and this one can be prevented from summoning another card whereas most of the new stuff get a unit or 2 regardless. All I would say this unit is really good for is maybe fueling the drop zone for Legion if you haven't already done so and bringing out boosters if you're starving for them since trying to chain attacks by summoning another attacker over another's too flimsy, especially since the new unit gains no new power. Light Saver's not brilliant. Get it for collection purposes and leave it at that. "Sure is getting all Star Wars in here." 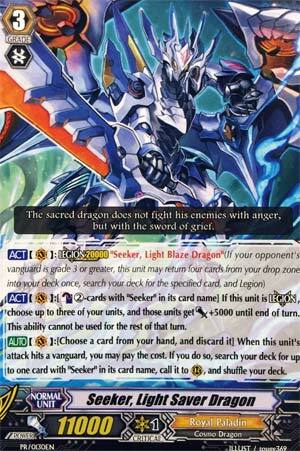 Anyway, as a type-2 Legion, Light Saver Dragon is easily one of the best Seeker Legions, period. If successful in hitting a Vanguard, you can pitch a card from your hand to superior call a Seeker to the field from the deck. Need an extra attacker? Need Rune Eagle for Legion boosting? Need an Especial Intercept? Pitch a card and get it to the field. But that Legion ability... It's Holy Charging Roar, just in Legion form, which can affect not only rear guards, but also the Legion and the Mate. Before I go any further, the mate, Light Blaze Dragon, gives +5000 for the turn if it lands an attack, as a rear guard, on a vanguard. Anyway, especial counterblast 2, make your whole field swing for over 25000 and make your opponent burn their shield up to stop your attack. This is a great Legion for any point. Need set-up? Send cards to be ready for Legion. Need a back-up Legion? Here's the best one. Need a primary Legion? This thing's on par with Alfred and STD for Seekers. So long as you have some counter blasts, Light Saver Dragon is good at any point in the game.